Art lives within the everyday consciousness of Laolu Senbanjo. The Nigerian-born and raised visual artist, musician and activist grew up with a keen interest in his Yoruba heritage, one rich in revealing the tradition and mythology through expressive forms and symbols. 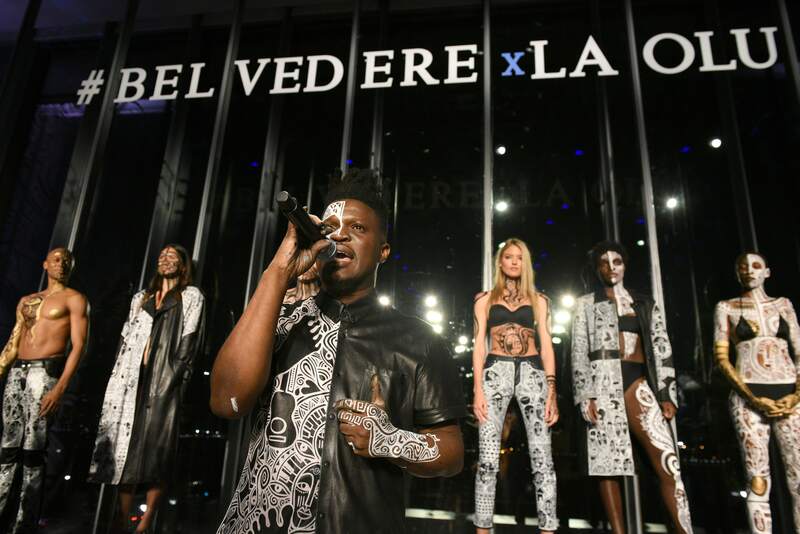 Artist Laolu Senbanjo speaks to an audience at Belvedere's NYFW event at The Whitney Museum of American Art. Following grade school, Laolu followed through with his parents wish for him to attend law school, though all the while, Laolu couldn’t help but fill his thoughts and notebooks with a visual language that was so innate to his core. He vividly recalls his grandmother teaching the narratives of the Orishas, or deities, with her pictorial storytelling and tattooed arms, revealing detailed symbols of Yoruba mythology. So after several years working at the Human Rights Commission as a human rights attorney, Laolu could no longer suppress the artistry and creative aspirations that lived within—it was time to move to New York and, at last, fulfill his deep desires. Since his daring leap of faith in 2013, Laolu’s artwork has been featured in Beyoncé’s Grammy Award-winning visual album “Lemonade,” he’s collaborated with Nike, and designed a perfume bottle with BVLGARI, to name just a few projects that have brought his lifelong dreams to fruition. Continuously creating, Laolu spends his time writing songs, performing with his band Laolu and the Afromysterics, decorating clothing, sneakers and objects for commissions, traveling to Nigeria for an upcoming documentary series, and preparing to release a collaboration with Starbucks. High on life and thrilled with his decision to trust his inner guide, Laolu is fully booked with projects until 2020. This month, Laolu celebrates the release of his limited-edition global collaboration with Belvedere Vodka, who has given the artist free reign to design the bottle which is inspired by his Yoruba culture. “His philosophy is ‘Everything is my canvas,’ says Rodney Williams, President and CEO of Belvedere Vodka. “So we wanted to give him as much leeway as we possibly could to let him express himself.” To top it off, this project comes full circle for Laolu—for every bottle purchased, (Belvedere) RED contributes to the Global Fund to help eliminate HIV/AIDS in Africa—a cause Laolu vehemently supported during his legal tenure in Nigeria. The limited-edition collaboration premiered during New York Fashion Week at The Whitney Museum of American Art, with a runway show that included Victoria’s Secret model Martha Hunt and the legendary Helena Christensen. We had the opportunity to sit down with the renowned artist to discuss his creative process, future aspirations, and most recent collaboration with Belvedere Vodka. How has your work as a Human Rights Attorney informed your art? LAOLU SENBANJO: In every project I work on, I see the human angle—how does this benefit people, how does this inspire people, how does this translate into something the everyday person can be linked to? As a human rights attorney, I worked with women and children, and the beautiful thing about the Belvedere collaboration is that proceeds of every bottle will be donated to women and children in Nigeria, giving free medication to those living with HIV/AIDS. That’s the same community that raised me. One of the best things for me is to create a piece of art, and in turn, for that piece of art to contribute to humanitarian work in Nigeria. That for me is a win-win. When you made the leap to move to New York, what was your initial impression? LS: It was one of wonder. I’ve been to Paris, Germany, Johannesburg—nowhere compares to New York. There’s this energy you cannot explain. It’s not that it’s all good—but there’s a drive here that you cannot find anywhere else. It reminds me of my city, Lagos. It’s like there is this bus, where if you’re invited to put your foot on the ground and do the work, there’s a possibility. Everybody here is walking around with a pocket full of dreams. People tell you their dreams everyday. People have jobs, but they have dreams. Everybody comes here to chase something. And everybody here has a backstory. Many people come from different places, so it makes it very amazing to meet people from other places. That was the thing for me—the possibilities are here. Which aspects of New York do you most admire? LS: One of the major reasons why I stayed in New York were the art stores—they were mindblowing. When I went to Blick or Michaels, I just said ‘Wow, I can do this with this’ so my head just kept spinning. And slow to fast, I left my old life and came into this new one, looking out for collaborations and working with other people, and it’s been amazing. From times of not having enough and just trying to survive, to now. As for your recent collaboration with Belvedere Vodka, what was your inspiration, and how did you instill Belvedere’s rich history into the design? LS: Working with Belvedere was the icing on the cake. I’ve collaborated with Nike and created a bottle for BVLGARI, but I hadn’t yet worked on a vodka bottle. This collaboration is unique in the fact that it gives back. I’m born and raised in Nigeria, so I used a lot of Yoruba mythology and symbols to interpret the content of the bottle. Belvedere seeks balance between rye and water, so I included waves of water and triangles to represent balance. You can see passion in the hearts, which stand for the 600 years Belvedere has been crafting their product. If that’s not passion, I do not know what passion is! And the bottle is an art piece when it stands alone. This is something I want people to look at, enjoy the product, and then put the bottle on their shelves as art. To collaborate with Belvedere, who understand what I am about, want to share my art, and give me free reign to make my own masterpiece—I am grateful for that. When you began creating art in New York, where did you begin and how did you generate momentum? LS: When I first moved to Brooklyn, there were many artists that I admired, so I joined Flatbush Artists, and I didn’t stop creating. I started using my Instagram to post my process of drawing and I began to teach people the meaning behind my art. I also started a YouTube channel, a Facebook page—I started putting stuff out. Working as a lawyer, I never had the time to make art the way I wanted to make it. So when I moved here, it was more of a release—I felt alive. I had this in me for a long time. When people see my art, they say ‘Wow! You’re doing a lot,’ and I’m like no, I’m not doing a lot, art is who I am. This is me. I feel alive, and I want people to feel that energy—that’s exactly what I live for. Forget money, people feel this art and connect with it emotionally. This is my main philosophy. And then one day you were creating art as usual, and you received an email from Beyoncé asking if you might be interested in collaborating on her Lemonade visual album. How did you feel at that moment? I’d love to discuss your performance art ritual, The Sacred Art of the Ori. How was this style born and how do you evoke the essence of your muses? LS: I’ve created The Sacred Art of the Ori by tapping into Yoruba mythology, art and culture. My grandmother played a very important role in teaching me about these traditions. I take different elements from different Orishas or deities—for instance, Oshun, a sensual and graceful woman similar to Venus in Greek mythology, or Shango, a masculine warrior similar to Zeus or Thor. These deities who have been around for generations have symbols and art associated with each of them. So when subjects tell me stories about themselves, I take these different elements and put them on the skin. Balance, inner beauty and passion—these are qualities of the Orishas I translate onto the human body, any canvas, and also the Belvedere bottle. You're also a musician. How do these two art forms contribute to one another? LS: It’s the same mindspace. I love to create—I love poetry, rhymes, making beats, sounds and tones. It’s like painting a picture—it’s all one to me. When I finish a piece of art, I can move to the piano and play some chords—I can feel this energy and transcribe that into notes, close my eyes and imagine. I know not everybody can—it’s a gift and I recognize that. It’s something so fluid, so natural, like a default for me. I can draw my art, sing my art, and art my songs. Might you be able to share a few words of wisdom from your mentors? LS: Even before the Beyoncé project, Swizz Beatz called me to his studio and spoke with me for almost six hours—it was one of the best nights of my life. He was teaching me about art and artists, and lessons he’s learned about life and within the art industry. He advised me to conserve. While the optics of driving a luxury car can be cool, it’s not everything. And he was a supporter from the beginning. Anytime I have ideas, I send him a message, and he invites me to discuss with him. He is very passionate, welcoming and supportive. I look up to him and Alicia Keys. For them to hold me high, have me teach their kids about Yoruba culture, and paint on their kids for events, they encourage me and wish for my success. They taught me that you are nothing without people’s love. And the first time I met Taraji P. Henson in the Empire studio in Chicago, she was jumping from room to room—I was so excited. We talked and talked. That’s a moment in life where you understand you never know whose heart you’re going to touch, or who is going to vibe with you. Keep doing what you’re doing and the right people will come. Be patient, stay in it, be in it for the long haul, and be ready, because anything is possible. We love your mantra, ‘Make your own magic happen’. What’s your advice for those interested in interrupting the status quo to pursue their dreams? LS: Be patient. Patience is something I had to learn because for many young artists, people want things to happen now, and if things don’t go the right way, it’s easy to get frustrated. But frustration is not a bad thing, because sometimes you have to be in the process, be in the present, and continue working on yourself. Ask yourself, if this didn’t pay, would I do it? Are you passionate enough? Does this make you feel happy? If these answers are yes, just keep doing it. Life is going to throw many things at you. But if you love what you’re doing, this will keep you on. Sad days, good days, happy days, bad days—I’m on, I can draw. Drawing for me me is a way of existence—it’s how I live and breathe. And that itself is a state of happiness when I’m in that process. As you continue creating, what are your future hopes and aspirations? LS: I want to paint on a spaceship—dream outside the norm and create work that is extraordinary to inspire people, because we do not have all the time. I use the mantra ‘Everything is my canvas,’ because I want to paint on everything. This is all a process; this is a journey. I am taking every step as it comes. I’m not in a hurry—I’m just going to keep doing what I’m doing, focus on the process, make amazing work and showcase my gift and my talent to the world. And what a better place to do it than in New York!